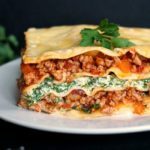 Turkey Lasagna with Spinach and Ricotta, my take on the classic lasagna, just a lot healthier and lighter. A great comfort food for a family dinner. Needless to say that this dish is so tasty and flavourful, you’ll find yourself making turkey lasagna again and again. Lasagna goes really well with kids too; if you have a fussy one like l do, give this recipe a try, they will just love it. 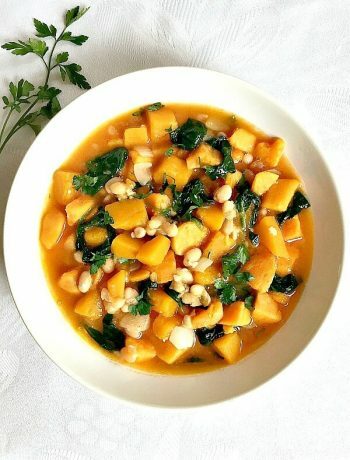 I do love cooking a wide range of dishes from around the world, and l’ve been sharing here some of my favourite recipes from different cuisines, but l feel that l have been neglecting the Italian one. It’s time l got this rectified with this hearty lasagna. 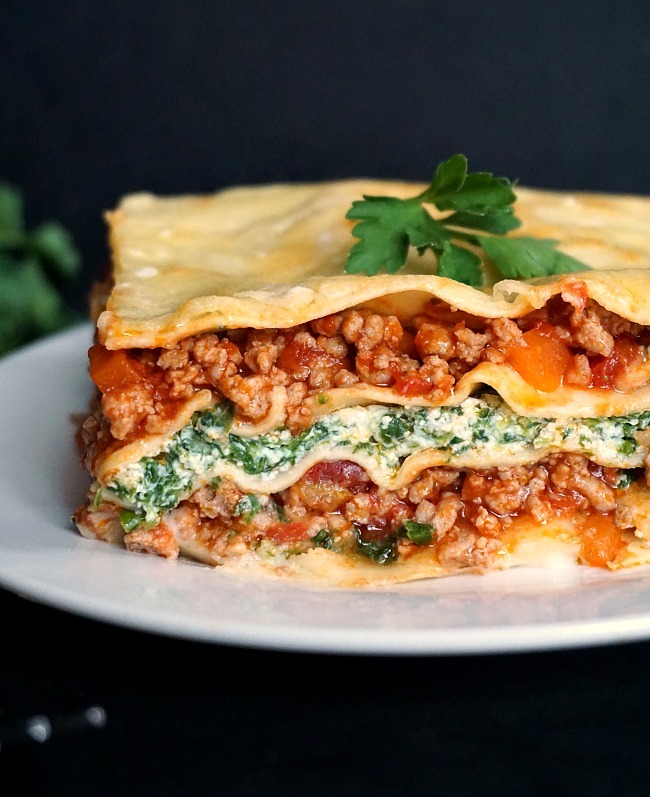 Although you might find that usually lasagna is made with ground beef, any other meat works great too, there is no rule here when it comes to personal choices. The addition of ricotta gives a creamy texture, while the spinach adds colour and extra goodness. There may be quite a few ingredients listed, but putting the dish together is easy and does not take that much time either. Lasagna sheets can be found in pretty much any larger shop, and there are quite inexpensive. I used the ones that do not require pre-cooking. I wasn’t very sure at first, was worried they might not soften well, but they are great, just 20 minutes in the oven and they get nice and soft. 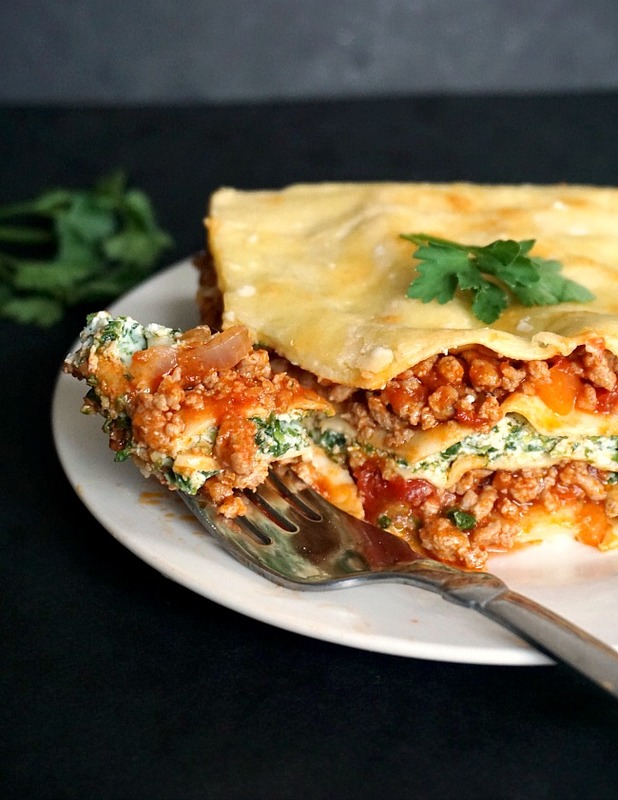 And since l mentioned that kids love lasagna, this is the perfect dish to hide any vegetables you like, so don’t be worried about using veggies that don’t usually get used in a classic lasagna.My daughter won’t eat any vegetables, unless they are cooked with pasta, rice, noodles or couscous. She won’t even look at spinach, but guess what, she was eating this lasagna with both hands, didn’t even care that the so hated spinach was in there. Toddlers, hey! Give this lasagna a try, and dinner will be a smashing success. Or if you are looking for more ground turkey recipes, how about a clean-eating spaghetti bolognese? 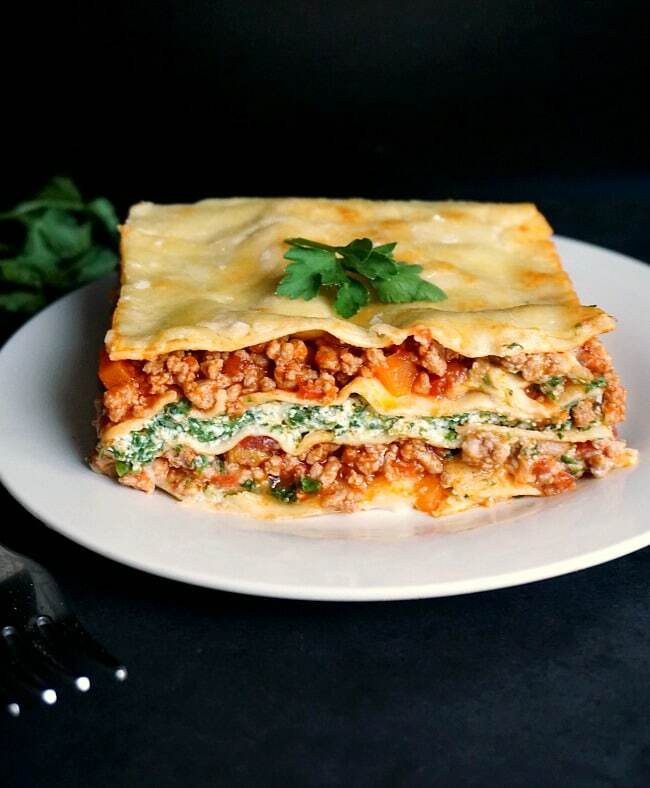 If you’ve tried this HEALTHY TURKEY LASAGNA WITH SPINACH AND RICOTTA or any other recipe on the blog then don’t forget to rate the recipe and let me know how you got on in the comments below, I love hearing from you! You can also FOLLOW ME on FACEBOOK, and PINTEREST to see more delicious food and what I’m getting up to. Peel and chop the onion, garlic cloves and carrot. In go the garlic and carrot, stir well and add the turkey mince. Continue stiring for 10 minutes until the turkey mince browns a little. Add the vegetable stock and bay leaves and leave to cook until all liquid is evaporated. Next, add the chopped tomatoes and cook for a further 5 minutes. Season well with salt and pepper and add the chopped parsley. Take the bay leaves off the pan. Remove from the heat and set aside. Now, to make a white sauce, melt the butter in a pan, add the flour and quickly stir to get a smooth paste. Pour in the milk, and whisk until you get a lump-free sauce, it should not take longer than 5 minutes. Season with salt and pepper, mix in the dijon mustard and half of the grated Cheddar and Parmesan cheese. Remove from the heat and set aside. In a bowl, combine the ricotta cheese with spinach. Now, time to assemble the lasagna. Spread half of the white sauce over the bottom of an oven-proof dish. Top with lasagna sheets, spread over half of the turkey mince mixture, top again with another layer of lasagna sheets, next goes the ricotta mixture, more lasagna sheets, the remaining turkey mince, again lasagna sheets. Spread the white sauce left all over the very top lasagna sheets and sprinkle some grated cheese over. Pre-heat the oven to 180 degrees Celsius. (360 Fahrenheit). Bake for 20 minutes until the cheese has melted and the lasagna sheets have soften. Thank you, Lina! It’s indeed a lovely dish! I haven’t had lasagna in forever! Great photos. Your layers look perfect! We are huge fans of lasagna in our family, I often use turkey and try to sneak in the spinach or leeks too. Kids haha..!! Oh yummy! 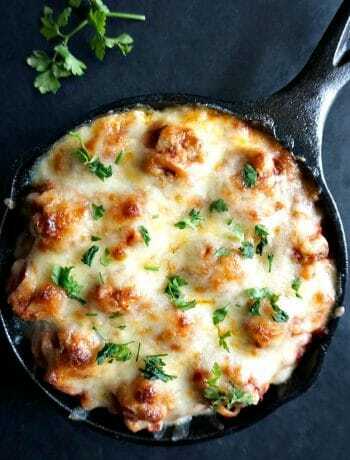 This seriously looks delicious and like something my family would just gobble up! On the dinner menu for next week! I do love lasagna! I’ve never tried the no-cook pasta simply because we make our pasta homemade. I don’t think any you child will refuse delicious pasta, meat, gooey cheese. If there are veggies in between the pasta they don’t notice. Your lasagna looks irresistible. I am ABSOLUTELY going to make this. I’m going to try using zucchini ribbons instead of pasta – just to up the veggie intake, but this looks EXACTLY what I am looking to eat! This looks so delicious. I love that it uses turkey, and includes spinach. A delicious and healthier change from traditional! We call our oldest Garfield every time we have lasagna for dinner because he can scarf down the entire dish in no time, spinach or not. 🙂 Lovely recipe! If I ever see lasagna sheets I’m snatching them up now! I never knew they made them but that would certainly save a ton of time. And those layers are AMAZING!!! Lasagna has been on my to do list for ever!..I am waiting to make an eggless sheets myself. Your dish with all those stuffing is awesome..very nice. What a great way to use ground turkey. It works perfect in this dish. It is a great substitute for the traditional beef. Wow – that sounds and looks delicious! Your photographs are done amazingly well – well done! Love lasagna! And love ricotta! This recipe sounds and looks incredible. Adding to my list of delicious dinners! We are lasagna lovers yes my kids love it I like your version with turkey , spinach and ricotta. It is always to sneak in some spinach in the meal. The layers in this lasagna?! Holy cow, I want to dive right through this screen. I love using turkey in my pasta dishes as it’s healthier than other meats and no one can tell the difference. I also love that you added spinach, which I do too! Your version has me salivating. Can’t wait to try! This sounds so delicious and light. I usually dont make lasagna at home as it tends to be so heavy and time consuming but your recipe looks easy and would try soon. Wow this lasagna looks FANTASTIC! Just look at that perfect layers!? Love the addition of dijon mustard in white sauce. Never tried that before. Also love that you used fresh tomatoes instead of store bought sauce. This sounds like something I must try… sooon! I have made my lasagna with beef like my mom has done for ages. Recently I made some with venison as we were out of ground beef in the freezer. I really need to try it with turkey and also try mixing my spinach with my ricotta mixture too! Just had this for dinner! Absolutely loved it! 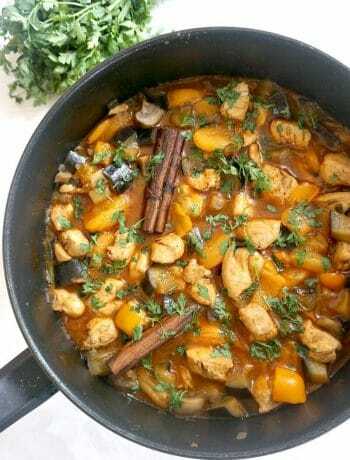 Added some more herbs here and there but overall a really nice and healthy recipe full of vegetables and protein! Even my partner had two helpings and usually he doesn’t “love” too many vegetables. I am very happy you liked it, my little girls, one is 1 year old and the other is 2 and a half years old absolutely love this lasagna. I make it quite often, and even my husband likes it, surprisingly, as he usually moans about meat. I can honestly say it’s way tastier than any store-bough lasagna.